The Clark Township is located in southern Cole County. The township has two voting precincts: Brazito in the northern half and Eugene in the southern half. 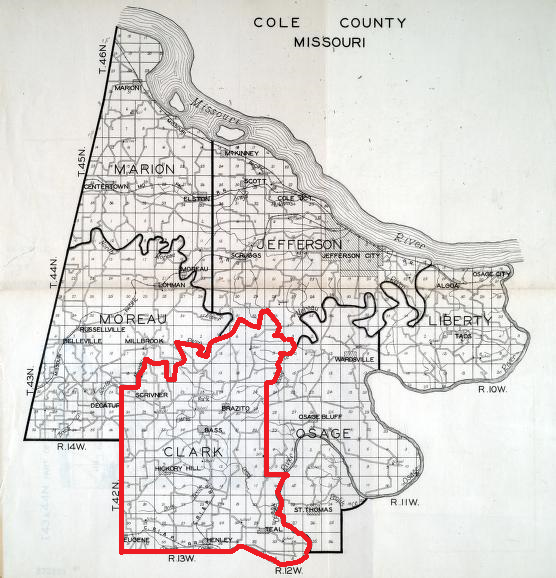 The boundaries of Clark Township include the Moreau Creeks and Moreau and Osage Rivers. This township was named for Mr. James Clark, one of the first settlers. The date of his migration from West Virginia to this county is not known. The Jefferson Township is home to Jefferson City, the State Capital of Missouri. The boundaries of the Jefferson Township are formed by the Missouri River on the north and Moreau and Osage Rivers on the south and east. The smallest and eastern most township in Cole County, Liberty Township's boundaries are formed almost exclusively by the Missouri, Osage and Moreau Rivers. 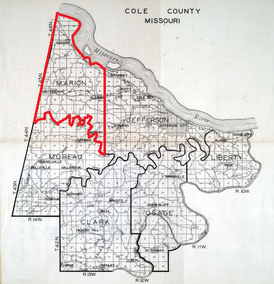 Marion Township on the western side of Cole County, was the home of the county seat in the town of Marion from 1822-1828 until it was moved to Jefferson City. The northern boundary of the Marion Township is formed by the Missouri river, the southern by the North Moreau Creek. The town of Marion was plotted in 1820, and named in honor of Francis Marion, a hero of the Revolutionary War, known as "The Swamp Fox." This appellation was given him because of his ability to elude British pursuers. Marion was born in South Carolina in 1732 and died there in 1795. Organized April 3, 1821 and named for the Moreau Creek which flows through the township, the Moreau Township adjoins both Moniteau and Miller Counties in central Missouri. 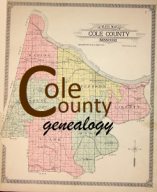 The only township to extend west of the Osage River, the Osage Township is settled in the southeast corner of Cole County. The Osage Township is named after the Osage River and thus the Osage Indians who were native to the area.